Deadly pesticides pose a serious hazard to the environment in the developing world. 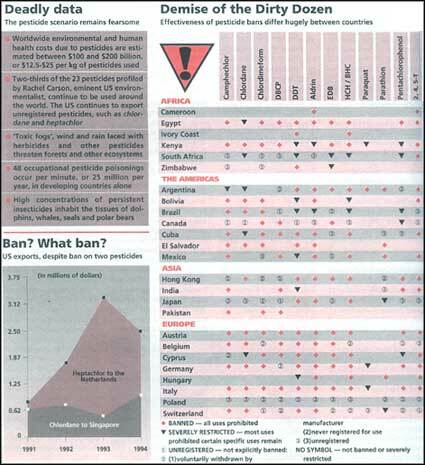 These countries continue to import banned pesticides from the West. At least $72.5 million of 12 banned pesticides, called the-Dirty Dozen, were exported from the US between 1991 and 1994. Worse, these dangerous chemicals end up in the hands of workers who lack the training or equipment necessary to prevent harmful exposures and poisoning. The problem is compounded by the lack of proper storage and management facilities in the developing nations. Indeed, today the Third World countries face the unenviable task of disposing of more than 30,000 tonnes of obsolete pesticides.